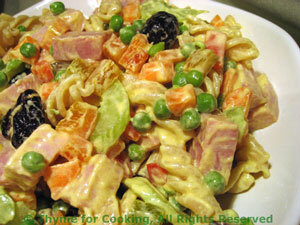 Thyme for Cooking Dinner tonight: Creamy Pasta Salad with Ham, Peas, Celery. I love peas and celery in pasta salads - such great color and crunch. This is a raw salad, the only thing cooked is the pasta. Cool food for hot weather.